When I worked in Switzerland many years ago, one of the changes I had to face was the fact my favorite American soft drinks were not available. After all, even though the beer was quite good, I like variety in my beverages. 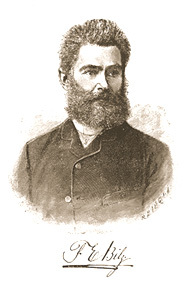 Friedrich Eduard Bilz (1842-1922) was a believer in naturopathic healing and social reform. Of course, the green hourglass bottle that urged me to "Trink Coca-Cola" was available, but it was more expensive than beer and I was not a big cola fan in those years. After a bit of experimentation, I settled on two beverages that were readily available and tasted pretty good. One was Elmer Citro; a drink I believe is native to Switzerland, the other was Sinalco. 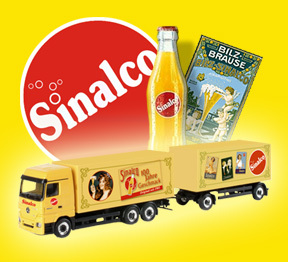 Sinalco is Europe's oldest brand of soft drink and it is celebrating its one-hundredth birthday in 2005. Like a lot of the new products that came out of waning years of the Victorian age, Sinalco was developed as a health aid by a devotee of natural medicine and sanitarium operator. Friedrich Eduard Bilz was Sunday's child, born on June 12, 1842 in Arnsdorf, Saxony. On that much all the sources I found agreed. After that, we run into a bit of trouble. He was either the sixth or seventh child in a farming family of modest means. He had a pleasant childhood with his family on the farm or his mother died when he was nine. He attended school in Arnsdorf until the early 1860s, when he moved to Meerane, where he learned to be a weaver. He soon married Marie Augusts Kriel, the daughter of the master weaver and either continued to work as a weaver and in a dye works, or ran the general store attached to the house Marie brought with her into the marriage. 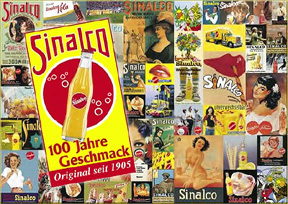 The theme of Sinalco's centennial promotion is "100 Jahre Geschmack" or "100 years of flavor". Image courtesy of Sinalco. In either scenario, Bilz became interested in writing and published a small brochure critical of the German society and social order of the time. Bilz also became interested in naturopathy or natural medicine, possibly because he suffered from a lung ailment and stomach cramps, and it was this interest that would make him famous. In 1872, naturopathy enjoyed a renaissance in Germany. Bilz immersed himself in the field, gathering all the information he could find about naturopathic treatment and trying the various methods, usually on himself. In 1882, he published his magnum opus, "The New Natural Method of Healing, A Golden Guide to Health, Strength and Old Age"
Bilz's book was a hit and remained in print for years after his death. By 1938, 3.5 million copies had been printed and the work, which eventually was expanded into four volumes, had been translated into twelve languages. The new Magic series model with Sinalco's modern logo, trademark bottle and a promotional graphic for Friedrich Bilz's original drink. Images courtesy of Sinalco and Herpa/Promotex. Whether he had been a weaver or a shopkeeper, Bilz was now a celebrity and had found his true mission in life. In 1889, Bilz and his family moved to Dresden and just a year later to nearby Oberlößnitz bei Radebeul, where Bilz could realize his dream of building a small health spa where he could offer patients the benefit of his research. The response to the new spa was overwhelming and Bilz was quickly able to expand his spa into a full-fledged sanitarium. In 1903, Bilz opened his "Licht-Luft Bad" or "Light-Air Bath," a huge outdoor swimming pool, which became another big attraction for his facility. I would need to check with Ray Kippig, my friend in Saxony, but I believe the original Bilz pool is still open. In 1911, he showed a new bath with artificial waves at the first international hygiene exhibition and later installed it at the Bilz sanitarium. While he was building his health spa, treating patients and writing, Bilz was also experimenting with natural remedies and wellness products. In 1902, Bilz created a new natural beverage containing citrus juice and mineral water for patients in his sanitarium. He called the new drink "Bilz Brause," which loosely translates to "Bilz Spritz" or "Bilz Soft Drink." He contracted production of the concoction to Franz Hartmann, a local bottler, and the drink soon became quite popular, spawning a host of imitators. In 1905, Bilz and Hartmann agreed they needed a trade name to protect the product and selected "Sinalco," made from the Latin words meaning "without alcohol." 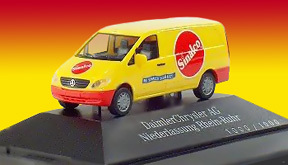 When DaimlerChrysler's Rhine-Ruhr branch won the fleet contract for Sinalco vehicles, this 1000-piece special-run model of a Mercedes Vito was created to commemorate the event. Image courtesy of Herpa/Promotex. Within two years, Sinalco was an international brand and had become popular in South America and the Islamic countries of the Middle East, where religious law forbids the consumption of alcoholic beverages. Financially secure, Friedrich Eduard Bilz devoted the rest of his life to social reform and natural medicine. He died on Monday, January 30, 1922 at the age of 79. Engraved on his tombstone was the phrase, "Nature was my guiding star." Bilz' soft drink continued to thrive. After his death, the focus of Sinalco's marketing began to change, promoting the drink as a lifestyle beverage rather than a wellness drink. Stylish couples and buxom young ladies began appearing in the advertising (pretty girls are still a major ingredient in Sinalco's promotions). In 1937, the brand acquired the big red dot that has become the Sinalco trademark and, thirteen years later, Sinalco began appearing in a distinctive ribbed bottle. This custom-decorated Mack Superliner rig is touring Germany as part of the 100th anniversary Sinalco promotion. Image courtesy of Sinalco. Over the years, the Sinalco brand has changed hands, being owned by Oetker and the Swiss Feldschlösschen Beverage Group AG, among others. Somewhere along the way, it seemed to lose its focus, becoming just one more "other" soft drink when the market share numbers were tallied. In addition, it faced increasing competition as Coca-Cola, Pepsi and other manufacturers expanded their presence and product lines in Europe. 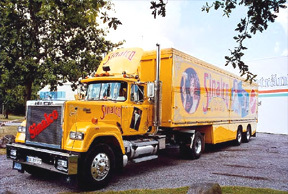 In 1994, the Sinalco was acquired by the Hövelmann Beverage Group in Duisburg, Germany. Hövelmann wanted to stimulate sales of the Sinalco line so they invested millions of dollars in new facilities and began aggressively marketing "Die Sinalco Schmeckt" or "The Sinalco Flavor." They reintroduced the trademark bottle and brought out new packaging for the restaurant and fountain trade. Today, Sinalco is offered in flavors like cola, orange, lemon, tonic water and ginger ale and is sold in 46 countries around the world. As far as I can tell, the closest it gets to the U.S. is South America, where it is popular in Argentina, Bolivia and Chile. According to Hövelmann, their investment is paying off: Hövelmann sold almost 77 million liters of Sinalco beverage products in 2002 and Sinalco Cola now commands a 40% share of the cola market in Germany. This year, to celebrate Sinalco's centennial, Hövelmann has decorated a special truck to promote the brand. I am not sure why a German company would use an American truck to promote a very German brand, but a bright yellow Mack Superliner is pulling the Sinalco trailer around the country to fairs and special events. This Herpa Private Collection replica of the Sinalco promotional truck is one of the new models announced as a May-June release. Click on picture for a larger view. Herpa will have two Sinalco trucks this year. The first is one of the diecast Magic Line models featuring a Mercedes Actros van with full trailer. The second, just announced as a May-June release, is a Private Collection edition of the 100th anniversary rig with a Herpa/Promotex Kenworth tractor. I was a bit surprised Herpa didn't make a Sinalco Mini Cooper, but that honor went to Highspeed, which produced a diecast model for Schuco. 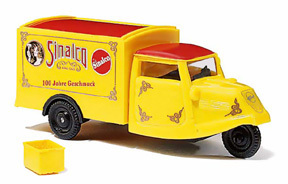 Schuco markets other Sinalco models, including another model of the centennial truck, this time pulled by a diecast Peterbilt 377. Busch’s new Tempo 3-wheeler wears Sinalco’s centennial livery. Image Courtesy of Busch Automodelle. Incidentally, I checked several different replicas of the Sinalco truck, but every one of them has a crucial error (in addition to being the wrong brand of truck): every tractor has tandem rear axles, whereas the real truck has a single rear axle. Busch will also have an anniversary model, a 1950s-era Tempo Hanseat three-wheeler, complete with a case of yellow bottles. If you live in an area where Sinalco is sold, you might want to toast Friedrich Bilz with your next one. There aren't that many soft drink brands that can boast "100 years of flavor."